A few months after he came home from Iraq, the Sergeant started having trouble breathing, and noticed numbness in his feet and hands. The military doctors he saw blamed his smoking habit: At 27-years-old, he’d been indulging in half a pack a day for five years. The Pentagon swore that the noxious smoke emanating from the military’s open-air burn pits — massive heaps of household trash, computer parts and even human waste that were used at bases in Iraq until last year, and are still being used in Afghanistan — weren’t at all responsible. “We all knew that huge plumes of smoke going into the air, all the time, can’t exactly be good for you,” says the Sergeant, who requested anonymity because he fears reprisal from his commanding officers. Now, one congressman wants the Pentagon to start paying attention to the accumulation of ailments. Rep. Todd Akin today announced a new bill that’d create a database of military personnel afflicted with health conditions they blame on burn pits. Indeed, the Sergeant, who has since been diagnosed with a degenerative neurological disorder and chronic respiratory infections, isn’t alone: Thousands of recently returned troops are coming down with myriad ailments, including respiratory problems, cancer and neurological defects, that many suspect were caused by the pits. Akin’s announcement comes only three days after the publication of a new federal report, issued by a committee at the Institute of Medicine, that should have shed some light on whether the substances in the burn pits were responsible for a host of health ailments, including respiratory problems, neurological conditions and even increased rates of cancer, that are afflicting recent veterans. Instead, researchers came up empty-handed: They detected 53 toxins in the air around Joint Base Balad, home to the military’s largest pit, but couldn’t determine which came from the burn pits and which were from other sources, including toxic dust storms and local industry emissions — largely because, they noted, the military had compiled so little documentation on the burn pits, such as what was burned and when, that it was impossible to generate any meaningful conclusions. 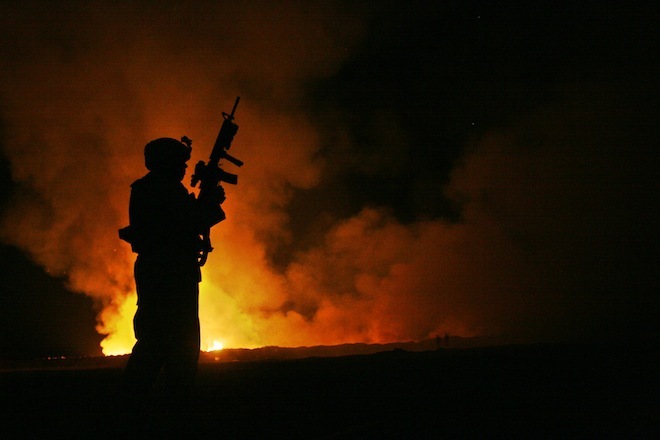 That thousands of soldiers were breathing in hazardous chemicals now seems to be a given — even the Institute of Medicine report acknowledges that, whether from burn pits or elsewhere, toxins clouded much of the air overseas. But whether or not subsequent illnesses are because of burn pits remains a mystery, and that’s largely because the military doesn’t have any data on who was stationed near the pits and whether or not they’re now suffering any ailments. Akin’s database would change that: He wants the registry modeled after that created in 1978 for soldiers exposed to Agent Orange, and operated by the Department of Veterans’ Affairs. And because much of the necessary data can’t exactly be obtained retroactively, a database of soldiers, their deployment dates and locations and their symptoms is the last chance for researchers to collect any tangible information — and, by monitoring health ailments and looking for patterns, someday determine exactly what caused the soldiers’ various conditions. Unfortunately, the passage of the bill doesn’t exactly guarantee that today’s troops will fare much better: The registry wouldn’t include regulations on compensation or treatment, which, more than three decades after Vietnam, remain unresolved points of contention in Congress.